In this marvellously atmospheric second book in Karen Lee Street’s series of Gothic tales we have travelled from London to Philadelphia. It is the late winter and early spring of 1844, a time when the city was in the middle of a perilous period of unrest where the local population rose up against the large influx of mainly Irish Catholic immigrants recently settled in the city. Edgar Allan Poe is back home from his adventure in England and living with his wife, Virginia and her mother who they affectionately call Muddy. Poe’s peaceful domestic life is disturbed when he receives a peculiar package in the shape of a hat box containing three dead crows with their heads severed. He decides that although there is no written note with the package; there is little doubt that it comes from his enemy George Rhynwick Williams. When Poe meets (by chance) the wife of Mr Williams at the theatre, where she is playing the starring role, she immediately appeals to him to put an end to the enmity that exists between the two men and procures a promise to a truce. However, when Poe receives three more unsettling packages he begins to perceive a threat not so much to him, but to his friend C Auguste Dupin the detective living in Paris. He must warn Dupin of the imminent danger. However, no sooner has he warned Dupin than there is another surprise waiting for Poe when he returns home after a walk to find Miss Loddiges waiting to see him. Miss Loddiges is an idiosyncratic wealthy English lady with a macabre dress sense who employed Poe in London to edit a book on Ornithology she authored. She has come all the way from England to ask him to investigate the deaths of two of her father's employees, a Peruvian father and son (that form an exotic bird collecting team). A journal kept by the son and despatched to England before his death contains a cryptic clue “They seek the jewel. All is within”. Can Poe help Miss Loddiges? Why is Mr Williams in Philadelphia? And will Poe’s warning reach Dupin in time? 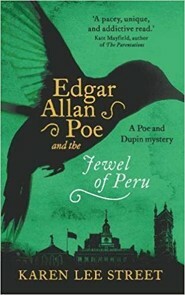 Karen Lee Street has taken a literary great in Edgar Allan Poe, claimed by many as the creator of the first detective story and his fictional detective creation C Auguste Dupin and very adeptly fashioned a highly enjoyable series. With her plots and characters she expertly creates the pattern and form of the 19th Century Romantic Gothic style. There are mysterious and dangerous villains scheming beneath the surface of the genteel suburban life of Philadelphia's middle classes. This is a cleverly penned work of intrigue and enigma. There are blind alleys and false dawns a plenty to satisfy the puzzle solver, while the characterizations are adroitly delineated and rich in detail to entertain those who search for the dramatic.